Emil Stejnar (* 1939) is an austrian born gold- and silversmith, a hermetic magician as well as a famous author and astrologer in many German speaking countries. He is known as the spiritual successor to Franz Bardon and has worked with, corrected and expended Bardon’s works for more than fifty years. In the preface to the new (German) edition of George R.S. Meads’ ‘Fragments of a Faith Forgotten’ Stejnar is mentioned next to great minds such as C.G. Jung, Mozart, Nietzsche and adepts such as Jakob Böhme, Papus, Eliphas Levi or Aleister Crowley as the last living gnostic. Today Stejnar lives secluded mostly in Sweden and doesn’t see visitors. For most of Stejnar’s life full of magical and astrological research none of his books were available for sale. Instead they were handed over to students with personal dedication only. When I started my practical magical training in the late 90s I only heard rumours about his books... My teacher held copies of his works but wouldn’t allow me to read in them, not even to flip through them. His book on guardian angels exchanged hands for huge amounts of money - only comparable to some of the works of Andrew Chumbley in the English speaking world today. Stejnar speaks with an immensely deep understanding of life and how magic can or cannot be used to enrich it consciously. He walks the fine line between practical magic and following a mystical path that cannot be controlled nor initiated through rites or robes or sigils or symbols. Yet only through life experience and practice. Yet, most of all it is when Stejnar writes about the allegedly simple stuff in magic, the basics, when it drove the blush on my face again and again. In this case his unique take on the forces of the four elements and how these impact who we turn into and how we can alter this again, belongs to the most fascinating and revealing passages on magical practice I have read in years. 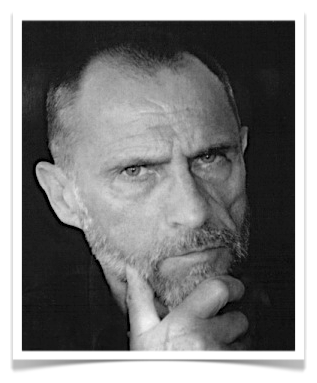 Note: for further information on Emil Stejnar in English I recommend the three translated interviews available at the Archive of Hermetic Texts. 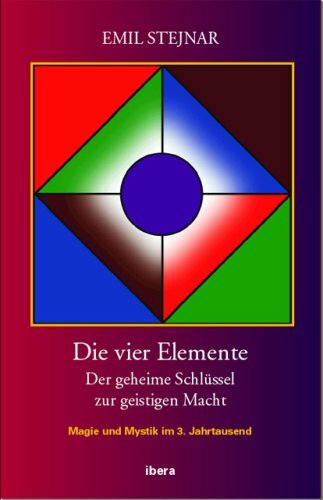 The Four Elements is the third book in Stejnar's series of 10 books of the master ('Meisterbücher') published since 2008. As the title says it deals with probably the most fundamental subject matter we come across in Western magic: How the four elements come together to shape the being we turn out to be, how they continuously over our life-time stay in motion, what moves them, and how we can learn to balance their influence within us through mindfulness, spirit communion and ritual practice. On the physical level these cells are called ‘Vitale’, probably best translated to English as ‘vitals’. These are the basic building blocks of physical life created from the merging of spirit and life. They dominate and regulate all sensory perceptions: visual, acoustic, tactile, olfactory and gustatory. All bodily perceptions are attributed to these cells. On the astral level we encounter the ‘Elementare’ or ‘elementaries’. To these we can attribute all emotional instincts, affections and reflexes. Often they are triggered and expressed on a subconscious level and dominate our inner attitude, mood and emotional state of being. On the mental level we find the ‘Elementale’ or ‘elementals’. These are relatively stable forms that connect to larger frameworks and provide structure to the elementaries. Here we encounter what linguists call an image schema and what we know as thought patterns, imaginations, ideas and conscious or subconscious assumptions and belief. Finally, there is another layer beyond these three, called ‘Planetare’ or ‘planetaries’. These are highly specialized compounds of cells within the mental-spiritual organs of our bodies. They actively create clusters of elementary and elemental cells and thus constitute the organs of subtle body. It is through these organs that the zodiacal and planetary forces enter our body and create the structure and balance of forces which we normally refer to as our personality. Furthermore from their forces and vital powers our bodies of light are created which is sustained and nurtured by transforming energy from the lower cells of our being. All these cells and physical and subtle organs are build from the forces of the four basic elements, Fire, Water, Air and Earth. These in turn, however, are built on the four ‘Urqualities’ or ‘primal qualities’: hot, cold, moist and dry. Explaining how these qualities shift, mix and coagulate to take form in certain character qualities and how to re-adjust and re-balance these through practical magical training makes for the majority of Stejnar’s book. The real innovation in Stejnar’s approach though is to perceive and treat at each Vital, Elementar, Elemental and Planetar as a conscious being in its own right. The circle of our skin that normally draws the line between the beings around us and the being we call ourself, vanishes in the human anatomy Stejnar presents. Instead it pervades through us, splitting our physical, astral and even mental bodies into myriads of spiritual beings who have all come to dwell and life and function inside of us. The traditional spirit model of magic is thus expanded into the human body. Now we are not only surrounded by daemons of divine and chthonic forces, yet they work directly through us by means of the ‘planetaries’. What remains to be called ourselves is not a single consciousness, but a hive of beings with a plethora of voices, desires, needs and greeds that pull us into multiple and often opposing directions at the same time... What we are left with is the chaotic, vibrant interplay of nature’s forces - all gifted with a tiny fraction of consciousness themselves. Rather than a single being, we turn into all of nature’s diversity of living beings - bundled up into a single microcosm. The path of the mage now is to consciously re-create and integrate these forces and beings into a unified body of light. The path of ‘Gnostic Hermetism‘ turns our body into the alchemical athanor as well as the triangle of the Arte at the same time. It consists of the hard work necessary to transform all these beings built into our very fibre of existence and to reassemble them under the dominion of what Stejnar calls the pure consciousness of the ICHSELBST, the ‘I-AM-SELF’. The discovery of and the gradual nurturing and strengthening of the I-AM-SELF is the centre Stejnar’s gnostic teachings. It is in light of this understanding of who we are as human beings that ritual magic takes on a new meaning: The magician now does not (only) deal with ‘external‘ daemons that he calls upon from the celestial or chthonic realms, yet he also acts as the tamer of their living forces within himself. Consequently Stejnar’s takes the point of view that inner magical work ultimately is of longer-lasting impact and meaning than any outer evocation can ever be. Because re-assembling our body of light, transforming the energy caught in our spiritual organs and realigning them around the central pillar of our I-AM-SELF consciousness is the most powerful work we can do. Well, thinking of my previous post I need to correct myself: Working on our magical body of light is the most powerful work we can do to transform ourselves from a chaotic petri dish that contains all of nature’s forces in potential, into a smoothed and sharpened tool, ready to contribute our piece of work wherever nature requires it. Towards the end of the book, almost when you think you sucked as much new thinking and practice out of the book as possible, it surprises again. In a dedicated chapter on invoking the 360 spirits of the ‘Erdgürtelzone’ (earthbeltzone) Stejnar again offers a very unique approach on the subject. In line with the principles he laid out on the human body he describes how these can be used to consciously create ‘Elementals’ in order to buffer and mediate the full impact of a daemon of the earthbeltzone streaming through an opened gate into your magical circle, or - worse - into your physical body. The root of the technique he shares has been described by others before (e.g. Franz Bardon, Alexandra David-Neel or Maria Szepes to name a few). Originally it derived from a Tibetan meditational practice and since then has been integrated into our Western way of ritual magic. Stejnar actually published a separate book covering the subject of the 360 genii of the earthbeltzone and their invocation or evocation in considerable depth. Unfortunately it hasn’t been translated into English at this point either. The interesting aspect of this technique is that it leverages two sigil-plates to be charged by the spirit in question. The large version (called large Kyilkhor) is used as a gate for the genius to pass through and for the conscious mind of the magician to make contact with it. A smaller version of the same sigil (the small Kyilkhor) creates the focal point for the forces of the genius once they entered through the gate of the large Kyilkhor. Thus the large sigil-plate forms the gate and the small version the container of power. Stejnar explains multiple substances from which these tools can be created including their advantages and disadvantages. Clay, beeswax, plant-stock and other elements of Bardon’s solid and fluid condensers make for the most powerful substance to transmit the conscious of the genius and charge its forces. Again bridging the divide between the magical and mystical path Stejnar goes on to explain a mystical invocation technique to leverage these spirit tools and make conscious contact with the respective genius in question. Thus the practitioner is further freed from the confines of the magical circle and can carefully work to integrate these powerful forces into his everyday environment. Stejnar’s book on the four elements presents the most accessible as well as sophisticated approach on the subject I have seen so far. It is both highly practical in the exercises offered as well as genuine and hugely innovative in explaining how the pieces of this huge puzzle can be fit together without applying any artificial force. What differentiates it mostly from the rest of occult training literature is (1) the depth of thought Stejnar applies to each subject he deals with and (2) the uniquely innovative perspective and practice he derives from it. This book will see an incredibly amount of attention once translated into English for sure. More than that, the way it helps the beginner - or experienced practitioner - to understand what magical works really is about and how it connects himself and the world around him is of unprecedented value. The subtitle of all of Stejnar's 10 books is called 'Magic and Mysticism in the 3rd Millennium'. Personally I don't think it is smart to make such a bold claim as the author yourself. Yet, in this specific case I can only shrug and nod. Fair enough.